Tom Petty is wrong: waiting isn’t the HARDEST part. It’s much tougher to sit in a room with a doctor and hear dire news about a loved one. Most of us have been there and that is downright devastating. We should be jumping for joy. My mother finished her chemo a few weeks ago, and last week’s CT scans are clear: no sign of cancer. 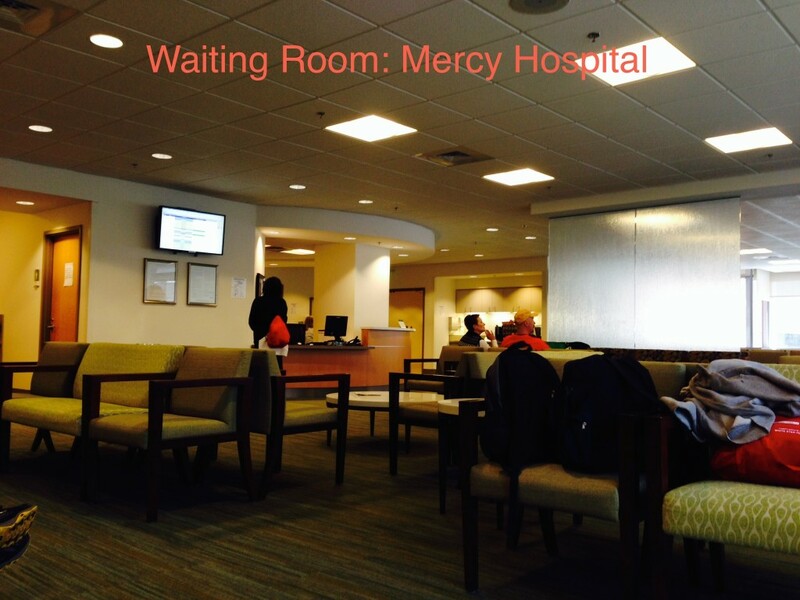 Instead we’re back at Mercy (what a name for a hospital! ): in the waiting room, in the pre-op prep room, in the operating room, in the recovery room. A complication from her cancer surgery last October worsened with each chemotherapy treatment. By the time my mother received her clean CT scan, the complication had become a major problem, which was negatively impacting her life on a daily basis. When she finally told the doctor about how bad it had become, he examined her and within minutes announced that he was scheduling surgery for the next week. So here we are. 8:30 arrival for registration and pre-surgery prep. Next, she’s brought back to a pre-op room where we are asked questions and informed of the details of the procedure by the floor nurse, the surgical nurse, the anesthesiologist, and the surgeon. On schedule. We see the last of them at 9:45. We should expect somebody to bring Mom to the operating theater in a few minutes, in preparation for the 10:30 surgery. And we wait. Fifteen minutes. Thirty. An hour. An hour and a half. It’s now forty-five minutes past the planned start time of Mom’s surgery. When we conferred with the surgeon earlier, he gave us some worse case scenarios regarding Mom’s surgery, which we didn’t want to mull over, but how could we not with all that time on our hands? The look on Mom’s face is desperate. She’s shifting positions and complaining that the IV line, inserted on the top side of her hand, hurts. She wants to know why they couldn’t use the port that was in her chest. Or at least insert the tube in her arm. I know she had a tough night and barely slept. For a few seconds, as we wait, she shuts her eyes. When she opens them, the litany of discomforts begin again. She tells me that she fears the worst case scenario that the doctor had described. I go to the nurse’s station, ask why we are waiting so long, when Mom will get wheeled up to surgery. She checks her computer, makes a phone call, and gives me the bad news: the doctor’s current surgery is more complicated than they’d expected; he is still operating on the patient and they’d called for some new equipment, in order to do an additional procedure. When pushed, the nurse says it will be at least another hour. Another hour passes. Two more pass before they finally take Mom upstairs at 1:30, leaving me to wait for an indefinite amount of time in the waiting room. We’d been told that the surgery would take about an hour and a half, but I had no idea when it would actually begin. I’m thinking that they only took her up because she’d been nasty to the surgical nurse after she announced a delay beyond the delay beyond the delay, which we’d been suffering through with increasing impatience. A reclining chair is available so I settle in with my heavy bag of electronics and miscellany: my laptop and charger, my phone, Mom’s phone, chargers for both our phones, my journal, my Kindle, a five section spiral notebook, a filled folder from the hospital, three apples, two Larabars, two wallets, two pairs of glasses (one of them wrapped inside purple latex gloves, which we stole from the pre-op room), pens, hair bands, loose change, tissues, and more. Thankfully, I’d put Mom’s clothes, shoes, and purse in the prescribed locker, so I didn’t have that added weight to carry and manage once I was seated. I had a plan: Get some writing done after I check in with my siblings and my mother’s siblings since I was supposed to call them around noon with post-surgery news. As soon as I got to the writing, I realized that I was seated under a television, blaring a soap opera, which was difficult to ignore. I couldn’t concentrate but I kept at it until I realized that I’d been typing the same letter over and over again on the page. I wondered if the surgery had begun. I checked my email. My Facebook account. My Twitter account. My Words with Friends games. My Hanging With Friends games. My email again. Facebook, Twitter, and so on . . .
My brother calls me three times. My aunt calls me. My mother’s cousin calls my mother’s cell. I get emails from family and friends looking for news. At four-thirty, I approach the desk. They make calls and tell me it should be another forty-five minutes, and that she went into surgery at two o’clock. That means three hours and fifteen minutes in the operating room, not the hour and a half the surgeon estimated. My heart drops. My mind goes to that awful place again. Nobody has any information. I try to read my book, get through a few pages before losing all focus. I stare out the window but see nothing. I look up and Mom’s surgeon pops out of a door and motions for me to come back to a room to discuss the surgery. He gives me the rundown of what they did. He tells me about the issues that might arise. He says I can see her when she wakes up. He leaves and I call a few people from the list that my mother and I made up the night before. When I tire of talking (which happens relatively quickly), I start emailing and texting and FB messaging the rest on the list. I hope they get my messages but am not concerned enough to call them on the phone. Too friggin’ exhausted from all of that sitting around and doing nothing except stressing out. Now I have to wait for the aide who comes down at the start of each hour to take families up to recovery to see their loved ones for ten minutes. It’s 5:15 so I have 45 minutes to wait. When the aide comes in, I stand up but I’m not on her list. My mother is still out from the anesthesia so I’ll have to wait until the 7 pm visit. Kill me now. By the time I finally see Mom, I am so mentally and emotionally wasted that I can barely think. She is in a lot of pain but won’t press the button for pain meds. She doesn’t like to take medicine. Her eyelids are swollen, which I point out to the nurse, who says she hadn’t noticed, but explains she didn’t have a baseline from which to make a judgment. This makes me anxious. I have to go back to my Mom’s place and sleep. And eat something other than apples and chocolate. But I feel funny about leaving her with someone who doesn’t see how swollen her face is. Then the aide comes to take me away. I tell Mom I’ll see her in the morning. I get her stuff from the locker and lug everything out to the car and drive home. Except in my dazed state, I miss my exit and have to drive an additional twenty minutes to get home. And I stop on my way to get a few things at the drugstore, where a homeless person asks me for money. I don’t give him any and then feel guilty for the rest of the night. Or that’s what I tell myself so I don’t have to think about what could happen in the hours that I am away from the hospital. I can’t fall asleep. I can’t eat anything except the ice cream I bought at the drugstore. I pull out my computer and after doing all my social media checks and game checks and email, text, and messaging checks, I decide to write the blog post that I began while listening to the soap opera blaring on the television. The writing calms me down but I’m not sure sleep will come. Once again, I am waiting. This time I am waiting until I can go back to the hospital and see my Mom; the waiting is hard, especially since until I get there, I won’t know if the swelling went down and if my mother finally took it upon herself to press the button for her pain medicine. Heavy sigh. You are your mother’s best advocate. Anything we can do, please call. In a heartbeat, 24/7. Hugs to all of you. Thinking of you – so hard at this time when you are the child and just want/need your mommy but have to be the grown up and take care of her. Thanks Suzanne. We do become our parents’ parents, don’t we? Your essay truly captures the emotion and frustration of waiting, not to mention the love and devotion you have towards your mother. I wish you both easy, restful days ahead. Means a lot Julie. Thanks. God Bless you and be with you and your mother during this difficult time Sara. Your title and picture this blog captured my attention, as I have spent many long hours in hospitals with loved ones with many positive and not so positive outcomes. I am happy to report more positive than not! Your title with “waiting and mercy” made me hope that you were learning about the “mercy” aspect of the “waiting” experience. In my waiting experiences, especially in the agonizing ones, I look back and realize that they have been extremely important learning moments for me. In the downright painful ones, particularly when the battle of the mind takes over, and there is a lot to lose in the possible outcome, these are the times in life that I learn most from. Spiritually speaking, I think that waiting is a journey and a process God uses to grow me, form me, transform me. These times teach my heart to trust, to hope, to have faith, to receive “mercy” in times of trouble. Always can benefit from your spiritual perspective. Nice to hear from you Kim! Sara, I had that experience when my mom was sick…only sibling in town; calling my sisters, aunt ps and uncles, etc at the end of a long day; trying to slow my mind enough to sleep; and then starting the next day, knowing it might be similarly demanding. Slowing the mind. That’s the trick. Haven’t learned it yet but know it’s the trick. Sara, your thoughts and words are so touching. You’re such a wonderful daughter. Even in Ferne’s worst moments, knowing how much you worry about her and love her must warm her heart. I can only hope she feels loved right now. She has certainly had a difficult time. Thoughts and prayers, my dear. Thoughts and prayers. I hope your Mom’s recovery is relatively rapid. Sounds like you’ve all been through enough already. Been through a lot but who hasn’t? I am comforted by your thoughts and prayers. What a day! Hoping tomorrow brings a good prognosis, healing for your mom, some rest for you, and less swollen eyelids! Hugs!! It’s Monday and she’s being released from hospital. All is good. Thanks for the love Debbie. Wow! I’m sitting here tense as you are. You definitely have a way with words, lady. This is a day later as I write this. I hope you got some good news. What an ordeal. Sending about a ton of hugs. It means the world to know my emotions came across in this post. Thanks for your kind words. Mom is doing very well and heading home today.